Sending this item as a gift? We would be happy to place a gift card. On the Checkout Page- you will find a box that says "Notes To Distinctly Montana Gifts". Simply supply us the FROM: and TO: info and any brief message. We would be happy to include the card with your gift. Your recipient will not see any pricing of the item(s) you select. Care Instructions: Machine wash cold with like colors, non-chlorine bleach when needed. Do not use fabric softener. Tumble dry low. 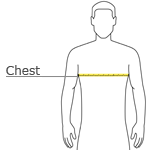 *With arms down at sides, measure seam to seam around the upper body, under arms and over the fullest part of the chest.